The armourer, Boothroyd, had been played by Peter Burton in Doctor No, and had supplied Bond with his legendary Walther PPK. Boothroyd (he was not credited as Q until Thunderball) and was in fact a character from Fleming's Dr No, in which he is responsible for kitting 007 out with a Walther PPK to replace his Beretta. This was because in a letter Fleming was corrected by a Glasgow guns expert, Geoffrey Boothroyd who wrote, 'I like everything about your James Bond except his deplorable taste in weapons. A Beretta 22 is utterly useless as well as being a lady's gun - and not a very nice lady at that!'. Fleming rectified the oversight, and the Walther PPK became Bond's gun of legend. In 1931 when the model PP was the main production weapon, Walther introduced a pocket version. The gun was the same as the PP except that the barrel had been shortened. The internal mechanism was the same, however the parts that were affected by size were of course different. The most significant change was in the frame. The total length of the PPK is 155 mm. The magazine holds one less cartridge. The barrel has six clockwise riflings. The back strap had been eliminated. They utilized a wrap-around plastic grip to give the frame a corrected contour. 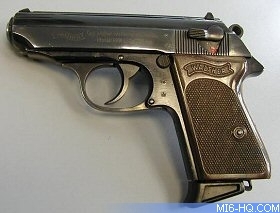 The firm then came up with the model designation PPK or "Polizei Pistole Kriminal". The name symbolized that it was to be used for covert undercover police work. The PPK was highly praised because of its compactness and reliability as well as the unique signal pin indicating that the gun was either loaded or unloaded. It protrudes from the rear of the slide when the chamber is loaded. If the chamber is empty it stays inside the rear slide. This loaded chamber indicator does not exist on the rim fire models, only the center fire guns. The PPK was readily suited for undercover and intelligence work. It was compact, reliable and of reasonable stopping power. Many of the post-war intelligence agencies standardized on the PPK. In addition to MI5 and MI6, the PPK has been used by German BND, Frances' SDECE, Israel's Mossad and Switzerland's Intelligence and Security Service. The Chinese intelligence service actually issued a PPK clone. After the World War II, both the PP and PPK were manufactured outside of Germany by the French firm Manurhin under the license from Walther. Only some design documents, which had been barely salvaged, served as start-up capital. As a result of the lack of production capacity and the prohibition of manufacturing, the decision was made to grant licenses for the production of various products. Walther was not able to begin manufacturing again until 1957. After the 1968 Gun Control Act went into effect and the PPK was barred from import, diplomatic pouches from Germany often bulged with brownish-red Walther PPK boxes. The GCA prohibited the importation due to the size of the gun. Under the legislation, a pistol must earn a number of points for various sporting features. The PPK could not earn the required points. The Walther firm, not wanting to lose US sales of the PPK, developed the PPK/s. By combining the frame of the PP, which was deeper than the PPK, and the slide of the PPK, the PPK/s was born. 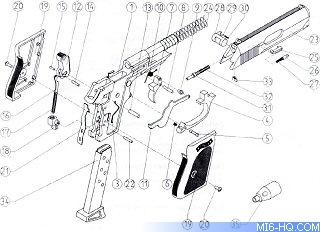 The PPK/s met all of the requirements for a handgun to be imported into the United States. The PPK/s was first manufactured in the United States in 1978 by Ranger Manufacturing in Gadsen, Alabama. Today the PPK and the PPK/s are both manufactured with the .380 ACP or 9mm Short standard. Those that still own the 7.65 guns have found that the newer .32 ACP Silvertip loading from Winchester still offers more than adequate stopping power. The Walther PPK or PP are still best carried with .380 ACP loads, a good personal defence caliber. This is provided that the shooting range is short. Only the American models have been produced in stainless steel. The German handguns are made with the blued finish.